To assemble: I cooked the steamfresh broccoli in the microwave. Then I boiled water on the stove. I added the spaghetti to the boiling water. The last 5 minutes of the spaghetti cooking time, I added the shrimp to the pot. When it as done, I drained the spaghetti and shrimp. 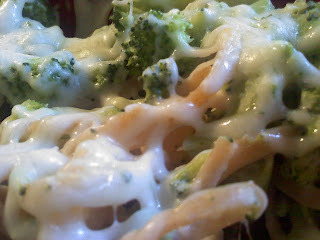 I put the spaghetti, shrimp, broccoli, laughing cow cheese and cream cheese in an oven safe bowl. Mixed it together until the cheese melted. Then I sprinkled the shredded cheese on top. I put the bowl in the oven and heated it until the cheese as melted and the whole dish was piping hot!! It was delicious! I was very satisfied!!!! The whole bowl came to 412 calories!!! In comparison an order of Shrimp Linguini from Red Lobster is 1100 calories! (Per the R.L. website) WOW! !